Draft: 2009, Milwaukee Brewers, 7th rd. Khristopher Adrian Davis was originally signed by Brewers scout Josh Belovsky…has a son, Pablo… graduated from Deer Valley (AZ) High School…attended Cal State Fullerton…his father, Rodney, played professionally as an outfielder in the minor leagues with the Dodgers and later scouted for the Diamondbacks…enjoys reading, table tennis and video games. Hit a Major League leading and career-high 48 home runs and ranked second with a career-high 123 RBI…it was his third straight 40-homer season and his third straight 100-RBI season…is the 22nd player in ML history with at least three straight seasons of 40 home runs and 100 RBI, the first since Ryan Howard had four straight from 2006-09…is the second Athletic to do it (Jimmie Foxx)…became the seventh player (12th time) in Athletics history to lead the majors in home runs, joining Socks Seybold (1901), Harry Davis (1904, 06), Tilly Walker (1918), Jimmie Foxx (1932, 33, 35), Mark McGwire (1987, 96) and Jose Canseco (1988, 91)…his 48 home runs ranked third in Oakland history and tied for fourth in Athletics history and were the most since McGwire had 52 in 1996…the 123 RBI tied for fourth in Oakland history, his 77 extra base hits tied for fifth and his 316 total bases ranked ninth…his 175 strikeouts tied for fourth… is one of three Athletics with three 40-homer seasons (Foxx, 1932-34; McGwire, 1987, 92, 96) and is the 10th with three straight 100-RBI seasons (Frank Baker, Jose Canseco, Eric Chavez, Foxx, Jason Giambi, Bob Johnson, Al Simmons, Miguel Tejada, Gus Zernial)…has 91 home runs over the last two years, which ties McGwire's Oakland record for home runs in back-to-back seasons (1995-96)…has 133 home runs and 335 RBI over the last three years…the home runs are the most in the majors over that span and the RBI rank third…the 133 home runs rank 10th on the Oakland career list…they are the most in Oakland history over a three-year stretch (previous: 125 by McGwire, 1995-97) and the most by an Athletic since Foxx had 150 from 1932-34…they are the most by a Major Leaguer over a three-year span since 2007-09 when Ryan Howard had 140… in addition to home runs and RBI, he also had career highs in at bats (576), runs (98), hits (142), extra base hits (77), hit by pitches (12) and sacrifice flies (tie, 7)…hit .247 for the fourth consecutive season…according to the Elias Sports Bureau, he is the first player in ML history to have the same batting average rounded to three decimal places in four consecutive seasons (min. 10 AB each year)…his .549 slugging percentage and .874 OPS were his best since his 56-game rookie season of 2013 (.596 and .949)…ranked fifth in the American League in slugging, tied for fifth in total bases, sixth in extra base hits and seventh in OPS…was also sixth in strikeouts, tied for sixth in hit by pitches, tied for seventh in sacrifice flies and tied for 10th in intentional walks (5)…led the A's in home runs, RBI, extra base hits, total bases, slugging, OPS and strikeouts…had more extra base hits (77) than singles (65) for the second consecutive season…hit 46 of his 48 home runs as a designated hitter, which fell one short of the ML record of 47 set by David Ortiz with Boston in 2006…had 118 RBI, which set an Oakland record for a DH and ranked seventh in ML history…broke the previous Oakland marks of 39 home runs and 114 RBI by Frank Thomas in 2006…won the Edgar Martinez Outstanding Designated Hitter Award after leading led ML designated hitters in home runs and RBI…batted .247 in 139 games as the DH and his games played tied for fifth most in Oakland history…the were the most since Dave Parker had 140 in 1989…led the majors with 27 home runs in 64 games after the All-Star Break and ranked second in RBI (59)…the home runs were the most in Athletics history after the All-Star Break (previous, 24: Foxx in 1933 and McGwire in 1996)…led the majors in go-ahead home runs (21) and tied Ramirez (CLE) for the lead in go-ahead RBI (33)…the go-ahead home runs were second in Oakland history to the record of 23 by Reggie Jackson in 1969…the go-ahead RBI tied for tied for third… ranked third in the AL in game winning RBI (17)…set an Oakland record and led the majors with 19 home runs in the seventh inning or later…tied for the ML lead with 38 RBI in the seventh or later…set an Oakland record and tied for the ML lead with eight home runs in the eighth inning… set an Athletics record and led the majors with four extra inning home runs…hit 35 of his home runs at night, which broke the Oakland record (33, Canseco in 1991)…hit .256 (109-for-425) with 37 of his 48 home runs against right-handed pitchers compared to .219 (33-for-151) against left-handers…the home runs off righties were second in Oakland history (McGwire, 40 in 1996)… had 46 home runs and 121 RBI in 146 games batting clean-up…the RBI set an Oakland record for the number four hitter and were the most by an Athletic since Gus Zernial had 125 in 1951…the home runs were second in Oakland history (McGwire, 51 in 1996) and the games played ranked fourth and were the most since Dave Kingman had 157 in 1985…has hit clean-up 376 times in an A's uniform, which is fourth mo14-gain Oakland history…23 of his 48 home runs came with runners on base…for the third straight year, 25 came against the AL West, which was one short of the Oakland record (26, McGwire in 1992)…had 10 home runs and 26 RBI in 19 games against Texas… the RBI were second most by any Major Leaguer against the Rangers (27, Brett Boone in 2001) and the home runs tied for second (11, Mickey Mantle in 1961)…is a .307 (61-for-199) hitter with 27 home runs and 63 RBI in 55 games against Texas in his three seasons with the A's…appeared in just 11 games on defense, including 10 starts, all in left field…did not commit an error in 17 chances and now has an 80-game errorless streak as an outfielder…singled in his only pinch hitting appearance. OAKLAND: Hit his third career Opening Day home run on March 29 against Los Angeles (AL)…all three have come as an Athletic, which ties the Oakland record for most career Opening Day home runs…shares the mark with Dave Henderson and Terry Steinbach…now has six career Opening Day RBI, which is tied for fourth most in Oakland history…started three consecutive games in left field from March 31-April 2, but those were his only starts in left field in an AL ballpark…made seven starts in left field in interleague play…had his first of seven two-homer games April 13 at Seattle…also had two-homer games June 8 against Kansas City, June 13 against Houston, July 22 against San Francisco, July 25 at Texas, Aug. 19 vs. Houston and Sept. 21 vs. Minnesota…it is the fourth time in Oakland history a player had seven or more multi-homer games in a season (8, Jackson in 1969; 7, Canseco in 1990 and McGwire in 1987)…now has 22 multi-homer games in his career, including 16 as an Athletic…was batting .272 over his first 23 games through April 23…then hit .145 over his next 20 contests from April 24 to May 16…broke a scoreless tie in the bottom of the 12th inning with his third career walk-off home run May 5 against Baltimore…it marked the first time in Athletics history the A's won an extra-inning scoreless game on a walkoff home run and just the fourth time in Oakland history the A's won a scoreless game of any length on a walk-off homer (last: Scutaro, Aug. 25, 2004 vs. Baltimore)…went 4-for-4 with a hit by pitch May 17 at Toronto…it was his fourth career four-hit game, his first since May 8, 2015 vs. Chicago (NL)…it was the second time in his career he reached base safely five times (May 26, 2014 vs. Baltimore)…was batting .235 with 13 home runs and 38 RBI in 47 games when he was placed on the 10-day disabled list May 23 retroactive to May 21 with a strained right groin…did not have a rehab assignment before he was reinstated from the DL May 31…started 97 of the A's final 98 games in AL ballparks at designated hitter…hit .205 over his first 23 games following his return from the DL…went 0-for-4 with four strikeouts June 10 against Kansas City…it was the eighth four-strikeout game of his career, his fifth as an Athletic (previous: Aug. 16, 2017 vs. Kansas City)... homered three times in a two-game stretch on June 13 and 14 against Houston but then had an 18-game homerless streak from June 15 to July 6, which was his longest as an Athletic and second longest of his career…had a career-high and A's season-high 14-game hitting streak from June 27 to July 12…hit .362 (21-for-58) with seven doubles and 11 RBI during the streak…hit .307 with 18 home runs and 39 RBI over a 29-game stretch from July 22 to Aug. 23… the home runs matched Reggie Jackson in 1969 (May 31-July 2 and June 1-July 3) for the most over a 29-game stretch in Oakland history…began the stretch by homering in a career-best four straight games July 22-25…had six home runs and 13 RBI over that span…the home runs matched the most in Oakland history over a four-game stretch (Mark McGwire, June 27-30, 1987)…had five RBI July 25 at Texas, his fifth career game with five or more RBI…batted .323 with nine home runs and a Major League leading 29 RBI in 25 games in July…tied for second in the AL in home runs and tied for third in hits (32) and extra base hits (17)…the RBI were second most in Oakland history in July (Canseco, 35 in 1991) and the most in any month since Frank Thomas had 31 in September of 2006…the home runs were the most by an Athletic in July since John Jaha had nine in 1999…the RBI and extra base hits were his most ever in a month…then hit 10 home runs in 27 games in August, which tied for the AL lead…it also matched the Oakland record for home runs in August (Brosius in 1995, Chavez in 2002)…it is the fourth time in his career he has homered 10 times in a month (11 in May, 2016; 10 in April, 2017; 10 in Aug., 2015)…finished the year with nine home runs and 19 RBI in 25 games in September …tied for second in the AL in home runs in September, tied for third in runs (21) and tied for sixth in RBI…had his average up to .263 entering play on Aug. 22 but then hit .191 over his final 35 games to finish the year at .247 for the fourth consecutive season…went 11-for-53 (.208) over his final 14 games beginning Sept. 14 but seven of the 11 hits were home runs and he had 13 RBI…hit his second career grand slam Sept. 16 at Tampa Bay (also May 17, 2016 vs. Texas)…had his fourth career walk-off home run Sept. 21 against Minnesota…started at designated hitter in the Wild Card game Oct. 3 at New York and went 1-for-4… drove in all of the A's runs with a two-run home run off Zach Britton in the eighth inning. Hit a career-high 43 home runs after slugging 42 in 2016 to become the second player in Athletics history with back-to-back 40-homer seasons…the other is Jimmie Foxx, who did it three straight seasons from 1932-34…joins Foxx (three times), McGwire (three times) and Canseco (twice) as the only players in Athletics history with multiple 40-homer seasons…the 43 homers tied for fifth in Oakland history and tied for eighth in Athletics history…is the only Major Leaguer with two 40-homer seasons over the last two years and his 85 home runs over that span are second most in the majors and the most by an Athletic in back-to-back seasons since Mark McGwire had 86 in 1996-97…had a career-high 110 RBI after driving in 102 runs in 2016 and is the first Athletic with back-to-back 100 RBI seasons since Miguel Tejada (2000-03) and Eric Chavez (2001-03)…the 110 RBI are the most by an Athletic since Frank Thomas had 114 in 2006…his 212 RBI over the last two years are eighth most in the majors and the most by an Athletic in consecutive seasons since Miguel Tejada had 237 from 2002-03…struck out a career high 195 times, which fell two short of the Athletics record of 197 set by Jack Cust in 2008…had the second most strikeouts in Athletics history and tied for 10th most in American League history…ranked second in the AL in home runs, third in RBI, tied for third in strikeouts, tied for fifth in grounded into double plays (20), tied for sixth in extra base hits (72) and tied for eighth in sacrifice flies (7)…batted .247 for the third consecutive season…slugged .528 and had a .336 on-base percentage, which were the highest of his four full seasons…also had career highs in games (153), at bats (566), runs (91), hits (140), home runs, RBI, walks (73), extra base hits and strikeouts…led the A's in runs, total bases (299), home runs, RBI, slugging percentage, strikeouts and grounded into double plays and tied for the lead in games, sacrifice flies, hit by pitches (6) and walks…hit 34 of his home runs as a left fielder, which is an Oakland record and the most by an A's left fielder since Bob Cerv hit 37 of his 38 home runs in 1958 as a left fielder…26 came at home, which tied for second most in Oakland history and fell one short of Jason Giambi's record of 27 in 2001…42 came batting fourth, which are third most in Athletics history (McGwire 51 in 1996, Foxx 44 in 1934)…led the AL and tied for third in the majors in go-ahead RBI (31)…tied for the AL lead and tied for second in the majors in go-ahead home runs (20)…the go-ahead home runs tied for second most in Oakland history and were the most since Jose Canseco also had 20 in 1991…hit .257 (114-for-444) with 36 of his 43 home runs against right-handed pitchers, .213 (26-for-122) against left-handers…batted clean-up 143 times, which is fourth most in Oakland history and the most since 1985 when Dave Kingman had 157…started 115 games in left field and 37 at designated hitter…hit .291 with nine home runs and 33 RBI as the DH compared to .233 with 34 home runs and 77 RBI as an outfielder…committed just one error in 116 games as a left fielder and his .995 fielding percentage is second best in Oakland history by a left fielder (Rudi, .996 in 1971)…however, his 1.95 total chances per nine innings are fourth fewest and his two assists match the fewest by a qualifier - two-thirds of team games (Henderson, 2 in 142 games in 1998)…his fielding percentage is eighth best in Oakland history by any outfielder…had the fourth highest percentage of swings that miss in the AL (33.7%). OAKLAND: Was the A's Opening Day starter in left field on April 3 against Los Angeles (AL) and went 3-for-4 with two home runs and two RBI…become the second player in Oakland history with two home runs on Opening Day (Jason Giambi, 2000 vs. Detroit)…it was his first of four multi-homer games (April 28 at Houston, June 28 at Houston, Aug. 25 vs. Texas) and he now has 15 in his career…tied the Oakland Opening Day record for total bases with nine (Reggie Jackson, 1974 at Texas)…became the first Athletic with three hits on Opening Day since 2002 (David Justice and Jeremy Giambi vs. Texas)…went 0-for-4 April 13 at Kansas City to snap a career-high 18-game reaching base streak dating back to Sept. 23, 2015…it also snapped a seven-game hitting streak and a six-game run scored streak… struck out in 21 consecutive games from April 17 to May 10 (33 strikeouts total) to set an Athletics record for consecutive games with a strikeout by a non-pitcher…broke that mark by fanning in 22 consecutive games from Aug. 11 to Sept. 5 (33 strikeouts total)…the streak is third longest by any Athletic (34, Vida Blue, April 9-Sept. 12, 1971; 29, Jim Nash, May 12, 1967-April 24, 1968)… finished April with 10 homers, which marked the third double digit homer month of his career (10 in August, 2015; 11 in May, 2016)…became the sixth player in Oakland history to hit 10 or more home runs in April, the first since Nick Swisher in 2006…matched his career high with four strikeouts May 8 against Los Angeles (AL)…it was his first of three four-strikeout games in 2017 (June 17 vs. New York-AL and Aug. 16 vs. Kansas City) and he now has seven in his career…played in the 500th game of his career May 6 against Detroit…had 112 career home runs and is the 25th player in Major League history with at least that many home runs in the first 500 games of his career…equaled his career high with three walks at New York (AL) on May 27 (also Sept. 14, 2016 at Kansas City)…committed his only error of the season May 31 at Cleveland and went errorless over his final 69 games in the outfield…hit .186 in May, which matched the lowest single-month batting average of his career (Sept. 2016 and July 2015)…then batted .299 in June and now has a .280 (80-for-286) career average in the month, which is his best for any month of the season… however, set an Oakland record for strikeouts in June with 42…it was the third highest total for any month in Oakland history (45, Cust in July 2008; 43, Monday in Aug. 1968)…had his third career walk-off hit June 15 against New York (AL), a two-run single in the bottom of the 10th… slugged his 100th career double June 22 against Houston…hit his second career walk-off home run July 15 against Cleveland (also May 17, 2016 vs. Texas)…it was his second game-ending RBI of the season and the fourth of his career…batted .207 in July and .200 in August…homered in three straight games for the third time in his career Aug. 6-9 (May 26-28, 2014 and Aug. 12-14, 2016)… snapped a career-high 0-for-20 streak with his 500th career hit Aug. 22 at Baltimore, a home run in the ninth inning off O'Day…batted .321 in September, which is the best single-month average of his career. Was acquired from Milwaukee on Feb. 12 for Bubba Derby and Jacob Nottingham and went on to bat .247 with 42 home runs and 102 RBI in 150 games…became the fifth player in Oakland history (Canseco, Giambi, Jackson and McGwire) and seventh in Athletics history (Foxx, Zernial) to hit 40 home runs…his 42 home runs tied for third in the American League, tied for sixth in Oakland history and tied for ninth in Athletics history…they were the most since Jason Giambi had 43 in 2000…became the 17th player in Oakland history to drive in 100 runs, the first since Frank Thomas in 2006 (114)…struck out 166 times, which ranked seventh in the AL and fifth in Athletics history…had career highs in games, at bats (555), runs (85), hits (137), home runs, RBI, extra base hits (68) and strikeouts and matched his best in triples (2)…led the A's with 137 hits, which were second fewest by a team-leader in Oakland history in a non-strike season (136, Dave Revering in 1979)…also led the club in runs, hits, home runs, RBI, strikeouts, slugging (.524), extra base hits (68), total bases (291), sacrifice flies (5), hit by pitches (8) and grounded into double plays (19)…hit .245 with 23 home runs and 47 RBI in 69 games after the All-Star Break after batting .248 with 19 home runs and 55 RBI in 81 games before the break…tied for second in the majors in post-break home runs and fell one short of the Athletics record of 24 (Foxx, 1933; McGwire, 1996)…batted .267 with 31 of his 42 home runs at night, .207 during the day…tied for second in the majors in night home runs and had the second best total in Oakland history…his .575 night slugging percentage was fourth best in the AL…hit 27 of his home runs as a left fielder, which was second most in the AL and one short of the Oakland record of 28 (Grieve, 1999)…his other 15 home runs came as the designated hitter, which were the most by an A's DH since 2009 (18, Cust)…batted .234 as a left fielder, .264 as the DH and was 2-for-4 (.500) as a pinch hitter…slugged 25 home runs against AL West competition, which fell one short of the Oakland record of 26 (McGwire, 1992)…hit 10 home runs against Texas, which were the most in Oakland history against any team…added eight home runs against Seattle, which were the most by an Athletic against the Mariners…hit 19 home runs at home, which were the most by an Athletic in the Coliseum since Jack Cust had 20 in 2008…however, had a .278 on-base percentage, which was the second lowest home on-base percentage in the AL…had 10 first-pitch home runs, which tied for fourth in the AL and were the most by an Athletic since Mark McGwire had 13 in 1996…had 42 home runs and 42 walks and his .307 on-base percentage was fourth lowest in Major League history by a 40-home run hitter…it was second lowest in 2016 (.302, Frazier CWS)…batted .243 with runners in scoring position, but that mark dropped to .159 with RISP and two outs…is a .153 (29-for-190) career hitter with RISP and two outs…hit just seven of his 42 home runs with two outs…appeared exclusively in left field on defense, where he committed five errors in 93 games…the errors were second most among AL left fielders (Grossman, MIN 8) and were the most by an A's left fielder since 1991 (8, R.Henderson)…made a team-leading 87 starts batting clean-up and 40 starts in the five spot…swung and miss at 33.9% of his pitches seen, which was second highest in the AL (Davis, BAL 36.8%). Batted .247 with 27 home runs and 66 RBI in 121 games with Milwaukee…had career highs in walks (44) and stolen bases (6) and matched his best in triples (2)…led the Brewers and tied for 10th in the National League in home runs despite spending over a month of the season on the DL with a torn meniscus in his right knee…hit 21 of his home runs after the All-Star Break, which ranked second in the NL to the Rockies Carlos Gonzalez (27) and tied for third in the majors (Davis, BAL 28)…tied for fifth in the NL in post-break RBI (48)…had just six home runs and 18 RBI in 50 games before the break…had five games with two or more home runs, which tied for third most in the NL…batted .260 against right-handed pitchers compared to .212 against left-handers…hit .296 with 16 home runs and 43 RBI in 66 games at home, .190 with 11 home runs and 23 RBI in 55 games on the road…tied for eighth in the NL in home runs at home…hit 15 home runs in 41 day games (fourth in the NL), 12 in 80 contests at night…10 of his home runs came in the seventh inning or later, which tied for third in the NL…batted .298 with 10 home runs when leading off an inning…made 107 starts, all in left field…committed five errors, which were the most among NL left fielders and tied for the most in the majors…had just one assist in 108 games overall in the outfield…went 4-for-11 (.364) with two walks, two home runs and three RBI as a pinch hitter…tied for third in the NL in pinch homers…saw his most action with 48 starts batting fifth and 31 hitting clean-up…started games at every spot in the order except third, eighth and ninth…made his second consecutive Opening Day start in left field for Milwaukee April 6 against Colorado and went 1-for-4…hit his first home run of the season April 29 at Cincinnati to snap a career-high 36-game homerless streak dating back to his last home run on Sept. 5, 2014…had a career-high 0-for-18 streak from April 29 to May 7…matched his career high with four hits May 8 against Chicago (NL)…it was the third four-hit game of his career…hit his second career pinch hit home run May 11 against Chicago (AL)…his third came later in the season on July 18 against Pittsburgh…had his first of five two-homer games May 25 against San Francisco…was batting .250 with five home runs and 16 RBI in 46 games when he was placed on the 15-day disabled list May 31 with a torn meniscus in his right knee…Dr. William Raasch performed surgery on the knee June 2…was sent to Single-A Wisconsin on a rehab assignment July 1 and went 2-for-20 (.100) with three walks and two RBI in six games before he was reinstated from the DL July 7…hit .246 with 22 home runs and 50 RBI in 75 games following his return…had seven home runs and 25 RBI over his first 68 games through Aug. 5…then had three two-homer games over a 13-game span from Aug. 6 to 19 and tallied 20 home runs and 41 RBI over his final 53 games starting Aug. 6…led the majors in home runs and tied for second in the NL in RBI from Aug. 6 through the end of the season…had two home runs and six RBI Aug. 6 against San Diego, two home runs and four RBI Aug. 9 against St. Louis and two home runs and five RBI Aug. 19 against Miami…the six RBI against the Padres were a career high…hit .228 with 10 home runs and 24 RBI in 26 games in August to earn Brewers Player of the Month honors…tied for the NL lead in home runs in August (Gonzalez, COL) and tied for third in RBI…earned the honor again in September/October after hitting .284 with 10 home runs and 20 RBI over his final 32 games…had a season-high six-game hitting streak from Sept. 18 to 23 (8-for-20, .400)…connected for his fifth two-homer game of the season Sept. 27 at St. Louis. Made his first career Opening Day roster after batting .262 (16-for-61) with 6 HR and 16 RBI in 28 games during Spring Training.....his 6 HR and 16 RBI led the team...Batted .279 with 11 HR and 27 RBI in 56 games with the Brewers...Made 32 starts (30g in LF, 2g at DH)...Had three stints with the Brewers (Opening Day-5/1, 7/12-7/14 and 7/23-end)...Batted .294 (35-for-119, 11hr, 27rbi) in 41 games during his final stint with the Brewers, replacing the suspended Ryan Braun...Led the team in home runs (11) and tied Carlos Gomez and Jonathan Lucroy for the team lead in RBI (27) following his 7/23 recall...Made his Major League debut on Opening Day vs. Colorado and grounded into a fielder's choice as a pinch hitter...Recorded his first Major League hit with a double off Patrick Corbin on 4/6 vs. Arizona...Hit his first Major League homer with a pinch-hit solo shot off Colt Hynes on 7/23 vs. San Diego...Became the fifth player in franchise history to hit his first Major League homer as a pinch hitter: Bob Hansen (1974), Trent Durrington (2004), Prince Fielder (2005) and Taylor Green (2012)...Batted .255 with 13 HR and 37 RBI in 69 games at Triple-A Nashville. Batted .349 with 12 HR and 47 RBI in 76 games with Double-A Huntsville and Triple-A Nashville. Appeared in 6 games from 6/29-7/6 with the Rookie Arizona Brewers as part of a rehab assignment while he recovered from a strained right calf. Was named Southern League Player of the Week for 7/23-7/29 (12-22, .545, 4hr, 9rbi). Was promoted to Nashville on 7/30. Was named Brewers Minor League Player of the Month for July (19g, .453, 7hr, 16rbi). Played for the Phoenix Desert Dogs in the Arizona Fall League. Was added to the 40-man roster on 11/20. Batted .280 with 17 HR, 84 RBI and 10 stolen bases in 125 games between Class-A Brevard County and Double-A Huntsville . Was a Florida State League All-Star. Was named Brewers Minor League Player of the Month for April (22g, .350, 5hr, 22rbi). Was promoted to Huntsville on 7/22. Batted .280 with 22 HR, 72 RBI and 17 stolen bases in 128 games at Class-A Wisconsin. Was selected to the Midwest League's midseason and postseason All-Star teams as he ranked among the leaders in home runs (T2nd, 22) and slugging percentage (4th, .499). His 22 HR set a new Wisconsin single-season franchise record. Was named Midwest League Player of the Week for 6/21-6/27 (5-11, .455, 2hr, 4rbi). 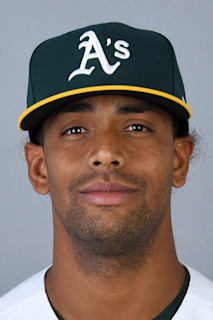 May 31, 2018 Oakland Athletics activated LF Khris Davis from the 10-day injured list. May 23, 2018 Oakland Athletics placed LF Khris Davis on the 10-day disabled list retroactive to May 21, 2018. Right groin strain. February 12, 2016 Milwaukee Brewers traded LF Khris Davis to Oakland Athletics for RHP Bubba Derby and C Jacob Nottingham. July 7, 2015 Milwaukee Brewers activated LF Khris Davis from the 15-day disabled list. July 1, 2015 Milwaukee Brewers sent LF Khris Davis on a rehab assignment to Wisconsin Timber Rattlers. July 23, 2013 Milwaukee Brewers recalled LF Khris Davis from Nashville Sounds. July 15, 2013 Milwaukee Brewers optioned Khris Davis to Nashville Sounds. July 12, 2013 Milwaukee Brewers recalled Khris Davis from Nashville Sounds. May 2, 2013 Milwaukee Brewers optioned Khris Davis to Nashville Sounds. November 20, 2012 Milwaukee Brewers selected the contract of Khris Davis from Nashville Sounds. July 30, 2012 Khris Davis assigned to Nashville Sounds from Huntsville Stars. July 9, 2012 Khris Davis roster status changed by Huntsville Stars. June 29, 2012 sent LF Khris Davis on a rehab assignment to AZL Brewers. June 9, 2012 Huntsville Stars placed LF Khris Davis on the 7-day disabled list retroactive to June 7, 2012. June 4, 2012 Huntsville Stars activated LF Khris Davis from the 7-day disabled list. May 6, 2012 Huntsville Stars placed LF Khris Davis on the 7-day disabled list. March 10, 2012 LF Khris Davis assigned to Milwaukee Brewers. July 22, 2011 LF Khris Davis assigned to Huntsville Stars from Brevard County Manatees. April 7, 2011 Khris Davis assigned to Brevard County Manatees from Wisconsin Timber Rattlers. March 27, 2011 OF Khris Davis assigned to Milwaukee Brewers. April 5, 2010 Khris Davis assigned to Wisconsin Timber Rattlers from AZL Brewers. August 3, 2009 Khris Davis assigned to AZL Brewers from Helena Brewers. June 27, 2009 Khris Davis assigned to Helena Brewers from Milwaukee Brewers. June 25, 2009 Milwaukee Brewers signed Khris Davis.